Planet Woman's Valleyview location in Kamloops has become the area’s only indoor tanning salon. In addition to our great training and fitness programs, we offer a great stand up tanning bed with a private change area and great prices on tanning lotions. The type and amount of lotion that you use to enhance your tan can be very important! Make sure you take some time to learn a bit about the different options available and which one is best for your skin type. You already know how moderate tanning can improve your health and the lotion you choose is just another piece of the puzzle. Our trained staff is here to help! Since we have been offering tanning to our clients, we decided to try out a few of our lotions so we can offer advice aside from just the luxurious scents. For your reference, DHA is a sugar that reacts with the amino acids on your skin to produce melanoidins – thus giving you that bronzed bod. DHA can be produced synthetically or made from natural ingredients like beets or cane sugar. 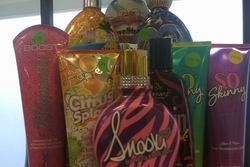 The first lotion we will cover is Supre Tan’s Kiss Me Again. This lotion comes in a square bottle which is a little odd but its one of our favourites. The lotion has light reflecting bronzers with DHA that continues to darken after you exposure. It also contains tan maximizers that work with your body to stimulate melanin (body’s natural tanning mechanism) production. Kiss Me Again is made of almond oil, shea butter and honey to help soothe and renew your skin leaving your silky and soft after use. Some lotions are heavy but Kiss Me Again is very lightweight and quick absorbing – helping to deliver nutrients and hydration for a great tan. It’s a staff favourite due to the smell and color it provides. Supre Tan Love Me is also another favourite. It contains a dark bronzing blend of dark walnut, henna and DHA which boosts the deep tan after exposure. It also contains the same tan maximizers as the Kiss Me Again. Love Me also contains aloe, vitamin A, vitamin C and vitamin E for luxuriously soft skin. This one is also paraben free – an added bonus. This one is similar to the Kiss Me Again with our staff reviews and smells great. Supre Tan’s Love This (Pink) contains the same as the two previous and smells great but I found that my tan didn’t build as well as the previous two and it didn’t last as long. Love Love This (Pink) would be a great option if you were tanning for a few weeks leading up to a trip. I wouldn’t recommend it if indoor tanning was your only source of that “just back from vacation” look. Next up is High Fashion Tanning Fashion Fatale. This contains a biobronzing formula free of DHA and provides a long lasting color. Added silicones and argan oil smooth your skin for a silky smooth touch. Most tanning lotions are a creamy brown color but Fashion Fatale is light pink in color – I was actually surprised. The lotion is lightly scented for those looking for something soft. The lotion goes on lightly and absorbs quickly. My skin was amazingly soft after using this lotion. I did find that I was a little red after I used this lotion but I attribute that to tanning back to back – we recommend giving your skin a days rest between tans. We have many other staff favourites – some with natural bronzers and some with shimmer in their lotions (my personal favourite). Others have great smells but as for which is best for you, I believe it comes down to personal preference and your body’s natural ability to tan. A lotion always helps to build that tan and keep your skin hydrated. Hydrated skin in key to keeping a luxurious bronzed bod.